Platinum joins Pilot and Sailor as part of the "Big Three" Japanese fountain pen makers. All three have a long history of producing quality products, from entry level up to the most expensive custom pens you can find. Buy a fountain pen with one of these three names stamped on it and there is a high likelihood you will have a good experience. Platinum does entry level as good as any of them, with the famous Platinum Preppy leading the charge. I've made no bones about how great I think that pen is for $3. The Platinum Plaisir is the cool older brother to the Preppy and fits right in with the family. The Plaisir features the same fine, firm nib as the Preppy but upgraded the design of the barrel greatly. Not only does it feature a lightweight, silky smooth aluminum body, it also has an innovative cap that allows the pen to be stored for a year without drying out. That is a great feature for me since I often have many pens inked up at once and don't use them all every day. I went with the more recently released Gunmetal color for my first Plaisir and there are several other colors to choose from in both 03 Fine and 05 Medium nibs. I syringe filled an empty Platinum cartridge with Pelikan Edelstein Topaz ink for the awesome combo you see on the page above. I have been very happy with the Plaisir and it will continue to see frequent use. 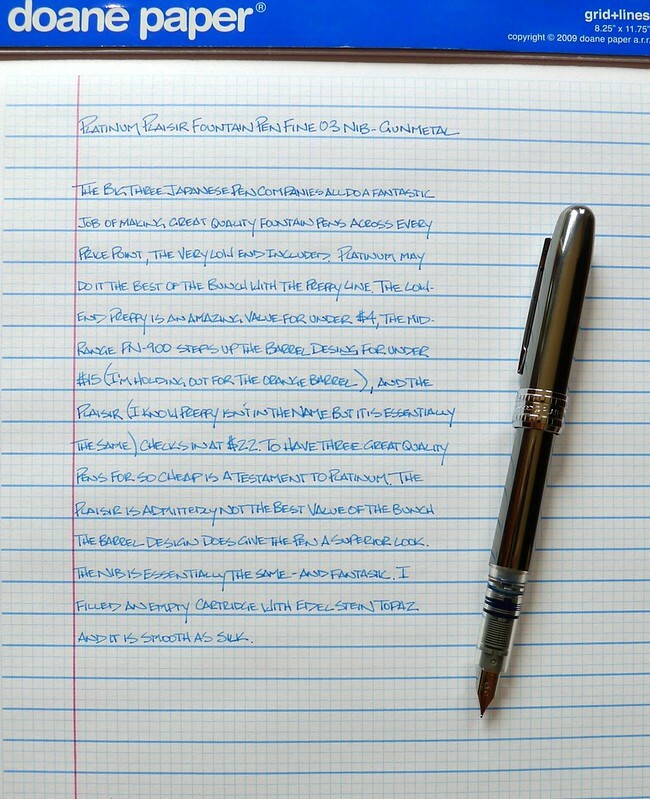 Posted on August 29, 2013 by Brad Dowdy and filed under Pen Reviews, Platinum, Fountain Pens.